Here's something Quite Interesting: according to my increasingly outdated 7th edition of Chambers, the word "serendipity" derives from Serendip, a former name for Sri Lanka. They may well serve a cheering cup of Ceylon at the delightful Dancing Goat, a serendipitous find on a far-flung foray to Framlingham. Wet Wednesday, premium parking, trad. teashop full to the Sally Gunnells, then spotted a subtle Lavazza sign over the road. Cosy (and dry) inside, not stilted and walls adorned with original artwork not obviously for sale. One table occupied by a lady making use of the free WiFi on her Apple laptop: like the long-ago Wild Strawberry, I take this as a Good Omen. We take comfy seats nearly sitting on the counter, meaning we can order from our seats. Appears at first that all items on the menu, inc. Andy's tart, should carry the disclaimer "may contain goat's cheese". Me and Grenvyle plump for paninis with more mainstream dairy products. Blessed are the cheesemakers. Pre-food drinks are good, from A's quality shake through G's hot tea to my Fentimans Mandarin and Seville Orange Jigger. Post-drink food is better than good, well presented and served on that sure sign of quality, the Big White Plate. Super pleasing salami panini, posh salad 'pon side. By this time, place has filled with fine arty Fram folk. We later realise there's an upstairs too (unless that's just the loo). Guts that we are, there's no resisting the cake selection, brazenly pimping themselves as "delicious" and "tasty". Eat me! No, me! Carrot cake is up there with the best; Americano is suitably strong. Plus there's newspapers. And the service is good. 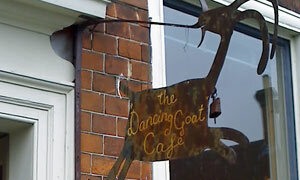 Leave the kids in school and take your partner for a long lunch at the Dancing Goat. There, review complete with no goat puns. Only kidding. If it was a car -- Honda Civic Hybrid.